Some of the best food in Southeast Asia comes from the little stalls and carts dotted around cities like Bangkok, serving steaming bowls of noodles, stir fries and the occasional deep-fried insect or two. Leeds is a long way from Bangkok, especially on a wet Friday evening in February, but the restorative power of chilli, ginger and garlic in a bowl with noodles and a chicken broth works at any time and in any place. Tampopo’s menu is based around this sort of street food – traditional Asian dishes – noodles, rice, stir fries, curries – prepared well, cooked perfectly and served with a huge smile. We started with a platter of mixed street snacks – Vietnamese rolls filled with vegetables and glass noodles, pork filled Japanese gyoza, rare, marinated Korean beef, chicken satay and the most incredible butterflied, breadcrumbed and deep-fried king prawns, a Thai delicacy with coconut added to the breadcrumbs. Next, I had the laksa. A good laksa should be fiercely hot, but the three chillies on the menu don’t really do justice to the sheer heat of this dish. I love chilli, but this was hot. 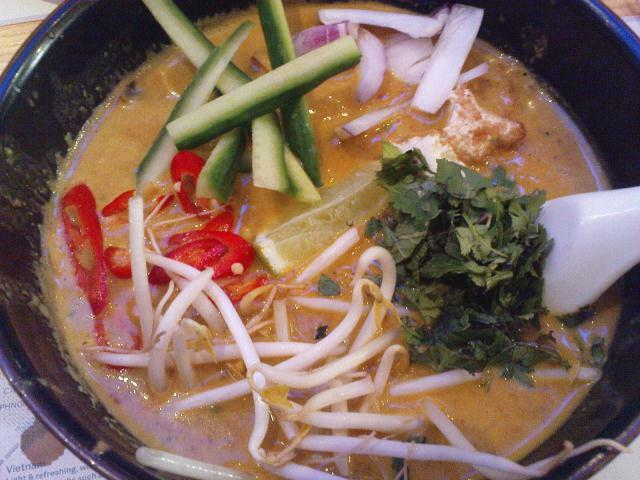 It was also excellent, a spicy coconut broth of chicken, yellow noodles, prawns, with mint, cucumber, red onion and tofu. The flavours were deep, complex and satisfying, with thick slices of chilli lurking in the depths of the bowl. I ate the lot, chillies and all. Dinner for two came to about £40, including a couple of beers, which I consider to be a complete bargain for food of this quality. A two dish lunchtime meal deal at £6.95 is particularly good value. The food at Tampopo is quite staggeringly good. It’s consistent, dependable and superb value. Tampopo is a perfect example of a smart, knowledgeable restaurant that serves excellent food in an uncomplicated and unpretentious way whilst managing to stay fashionable and welcoming. I'm so intrigued by a Vietnamese restaurant with a Japanese name! Any history on how or why it's called tampopo?